Automatic train control on Line 1 is supposed to be operational by the end of 2019, but this is no longer certain. The section from Bloor to Finch is now listed as “at risk under review”, and the budget for this project extends into 2021. Current peak service operates every 2’21” using 65 trains, 4 of which are “gap trains” used to deal with service problems. No additional service is planned until 2021 when service will change to a total of 68 trains, 2 of which are gap trains. This means an increase from 61 to 66 regular trains, or 8%. It is possible that ATC will allow shorter running times so that these trains can provide slightly more frequent service, but this is yet to be confirmed. A further 2 trains will be added in 2023, but this will be achieved by reducing the maintenance spare pool to 6 trains out of a fleet of 76, well below the spare factor the TTC prefers to have, and by eliminating the “capital maintenance spares”. However, the planned mid-life overhaul of the Toronto Rocket (TR) fleet ramps up in the mid-20s and will require capital spares. In 2026 and 2028 respectively, a further 6 and 3 trains would be added, but this would require buying more trains, including additional vehicles to restore the spare ratio. The next set of new trains for Line 1 is planned for 2029-2032 for capacity improvements and for the Richmond Hill extension. The TTC will not have enough storage space to hold additional trains planned for Line 1 unless it opens another yard. This is currently planned in Richmond Hill, but its availability depends on completion of the Yonge North Extension at least to the point where trains could operate to that new yard. An additional problem is that the Richmond Hill storage capacity was sized before the TTC fully appreciated the size of fleet required to serve both the extension and the reduction of headways from 141 to 110 seconds. Some years ago, there was a proposal for a underground yard north between Finch and Steeles that would provide more storage capacity without an extension all the way to Richmond Hill, but this was dropped. The TTC is now dependent on the Richmond Hill extension to reach the yard it will need to house trains to expand capacity within Toronto. Adding service to Line 1 will create congestion problems, beyond what already exists, at several stations. Bloor-Yonge is the most serious of these, but there are also issues at stations further south and at St. George. The extra service will also require improvements to the power supply to handle the extra trains. Except for Bloor-Yonge, the scope and timing of these upgrades has not been published. The 10 Year Capital Budget includes an unfunded $5.5 billion project to address capacity problems on Line 1. The design work was to begin in 2019, but even this is not funded. Spending was to ramp up to include construction starting in 2023. That date will not be achievable if the design work does not get underway. A separate unfunded $1 billion project specifically addresses Bloor-Yonge Station with construction tentatively budgeted for 2020-2024. The planned design (akin to the addition of a second platform at Union Station) has not yet been subject to public consultation. This will produce substantial construction disruption on nearby streets and within buildings above the station. Unlike Union, Bloor-Yonge is not entirely within the roadway, but lies under buildings on the north side of Bloor east of Yonge. The major change in plans for Line 2 is that replacement of the T1 fleet, originally targeted for the mid 2020s, has been changed to a 10 year Life Extension Overhaul with the intent of operating this fleet to a life of 40 years or more. This change was not the subject of a report to the TTC Board, and it appears to have happened during the interregnum when most of the Board members concentrated on getting re-elected. This change has pervasive effects through the capital budget, and for future capacity and service on Line 2. The TTC does not actually know whether the overhaul is technically feasible and will achieve the hoped-for lifespan. The experience with the shortfall in the streetcar life extension is fresh for everyone, and there is no guarantee that the T1 overhaul will achieve its aims. The projected cost is $715 million as compared to the $1.86 billion for replacement of the fleet that was included in the 2018 budget. That is $71.5 million per year for 10 added years on the T1 fleet, as against $62 million per year for a new fleet’s 30 year lifespan. The projected replacement cost rises from $1.86 to $2.27 billion thanks to inflation with the project’s deferral. By analogy to current performance of the TR (Line 1) and T1 (Line 2) fleets, the rebuilt T1s would almost certainly not be as reliable as new trains. The TTC routinely argues that newer equipment is better and points to performance stats of the rejuvenated bus fleet, the new streetcars, and the more-recent TR subway trains as examples. The project description for the overhaul has one glaring omission – there is no provision to retrofit Automatic Train Control to the T1 fleet. Assuming that this is even technically possible, that is a substantial expense on top of a price that is already higher than buying a new ATC-equipped fleet. However, installation of ATC on Line 2 is planned for 2024-2029, and the Line 2 Extension (formerly called the Scarborough Subway Extension) would be built with ATC from the outset unless the TTC plans a repeat of the debacle on the Spadina extension which was originally planned with conventional signalling. Service plans for Line 2 show minimal increase in capacity. One gap train will be added in 2019 to the 45-train service giving a total of 46 out of a fleet of 60 trains. Two trains will be added to regular service in 2024. At that point, the TTC would still have a spare ratio for T1s of 25% with a fleet of 60 trains of which 48 were needed for peak service. The TTC has a surplus of T1 trains thanks to the decision to operate Line 1 entirely with TRs. Originally some T1s would have remained on Lines 1 and 4, but this conflicted with the ATC program. Procurement plans show 14 new trains for Line 2 in 2026. Seven of these are included in the budget for the extension, and the other seven are net additions triggered in part by the decision to run full service through to Scarborough Town Centre rather than turning half of the service at Kennedy Station. However, there is no place to store these additional trains on Line 2 which is already bursting at the seams thanks to the transfer of the entire T1 fleet. Storage has been added at Greenwood and Keele yards, and a new storage track is planned for Kipling Station. The City is buying property for a new yard west of Kipling Station on the TTC’s behalf, and this yard was originally planned to come into service in the mid-2020s as a home for a new Line 2 fleet of TR trains. However, the Capital Plan shows this yard being available in 2031. This delay is almost certainly due to the City having no way to actually pay the $2.27 billion cost of the new facility within the original project time frame. There is no indication in any capital plans of when Line 2 will receive the actual benefit of full ATC operation and more frequent service. As on the Yonge line, power upgrades will be required as and when Bloor-Danforth receives substantially more service, but the scope of requirements is unknown. The comparatively recent change in plans from procurement of a new Line 2 fleet to life extension of the existing trains leaves Bloor-Danforth with constraints on capacity growth for the next decade. The budget assumes that the RT will continue to operate until 2026 when the Line 2 Extension opens to STC. There will be an increase in service in 2021 when the program to rebuild the fleet completes and the one capital spare train (out of a fleet of 7) is released. There is no plan for any increased service on Line 4 in the capital plans. Although it is not mentioned in the Capital Budget or Plan, the Relief Line design assumes that its trains will be serviced from Greenwood Yard. This would have been possible because Line 2 would have a new fleet served from Kipling Yard. However, with both the new fleet and yard for Line 2 deferred in the budget, it is not clear where a Relief Line fleet will actually live if that line is to open in, say, 2031. Both the RL and the Line 1 extension share a problem in that their fleets will have to arrive in Toronto before they open for service, but the yards that would provide this capacity will not be available in time. For all charts here, click on them for an expanded version. My apologies for the shading. Although these were originally prepared with coloured highlighting, the copies I have are black-and-white which lowers the contrast. The overall need for more subway cars is summarized in the following introductory text to the fleet plan. 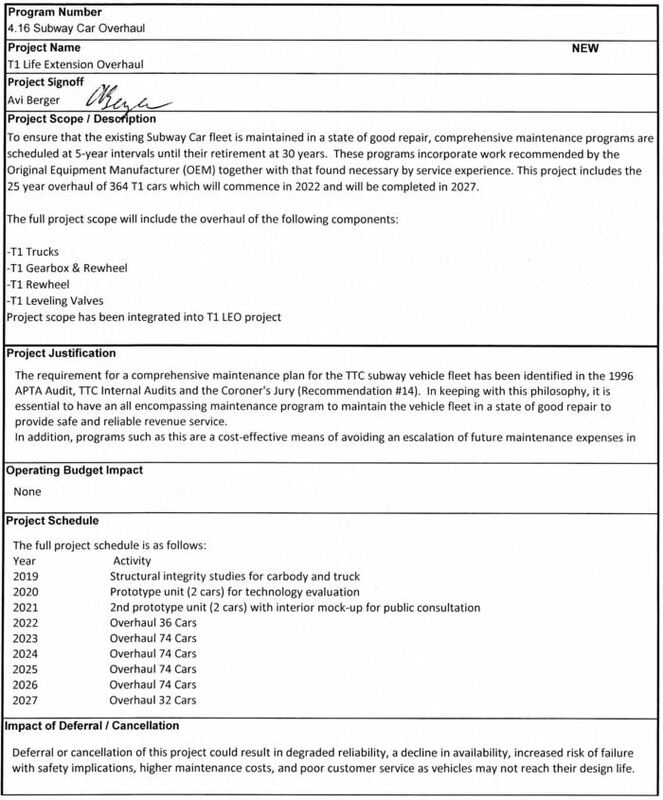 However, the text claims that procurement of cars for extensions (Scarborough and Richmond Hill) are in a separate program when, in fact, the numbers are included in the fleet plans for Lines 1 and 2. This leads to a table of planned orders for subway cars. Contrary to text in the table, the actual deployment of the trains is over half for expansion as explained below. This chart shows the planned acquisition of two sets of trains. Seven would be bought in the mid-2020s for the Line 2 Extension (SSE), and 44 would be bought for Line 1 YUS from 2029-2033. The SSE trains are explicitly noted above, and the Line 1 fleet plan (below) shows a jump of 20 trains for peak service from 2031 to 2032 corresponding to the Richmond Hill Extension. A further 4 trains would be required for 20% spares. Therefore 31 of the planned 51 trains are for expansion projects, not for ridership growth. This chart and associated text are misleading on that count. From a budgeting and funding perspective this is an important distinction because new trains for ridership growth are funded as free-standing projects, while trains required for extensions are charged to those projects. If requirements are mis-characterized as part of normal growth, this could artificially lower the total cost of an extension, and also affect funding arrangements. A key item missing from the fleet plan is a table of carhouse and yard capacities akin to what the TTC produces for its streetcar and bus depots. There is no way of knowing what capacity is available and planned, and how this relates to the number of trains that might, or might not, be acquired, nor to the concurrent existence of new and old fleets during transition periods. The Line 1 fleet plan shows a buildup of service every few years from 2021 to 2028 taking advantage of ATC to run more trains on the line. The peak service, not including gap trains rises from 61 in 2019 (the 65 shown above includes 4 gap trains), to 77 by 2029 (79 total minus 2 gap trains), a 26% increase. This corresponds to a reduction in the peak headway from 141 seconds to 112 seconds without any allowance for possibly faster trip times under ATC, and gets the line to its target service level for ATC in about a decade. However, the TTC will run out of room for new trains in 2029 even before the buildup of service and fleet for the Richmond Hill extension. A further issue is that the deficit in storage capacity is larger than current plans for storage at Richmond Hill. The capital spares are reduced to zero in 2021 even though this corresponds to a build-up in the spares needed for the mid-life overhaul of the TR fleet (see table below). The fleet goes into deficit in 2026 requiring more trains (82), even without capital spares, than the TTC actually owns (76). On several occasions during recent years, some members of the TTC Board asked when improved service was coming to Line 2 when all of the attention focused on Line 1. They were told that Automatic Train Control would bring more service by the mid-2020s. They were misled because the TTC’s plans do not call for a significant change in BD service levels within the 15-year scope of this plan. Other than a few extra trains for service that will use up all spare capacity in the T1 fleet on Line 2, the only additional trains are those included with the extension to Scarborough in 2026. The Life Extension Overhaul (LEO) of the T1 fleet was “approved” in 2018, although it is not clear when or how this happened as there is no public report associated with such a significant policy change. This extension and related changes in the timing of a new Kipling Yard and Maintenance Facility mean that the Line 2 fleet will not expand to provide shorter headways and greater capacity for the next decade. The LEO project description below appears to be unchanged from what had been the text of the 25 Year Overhaul project into which the LEO has been combined. This does not appear to include a component for addition of ATC to the T1 fleet. This could be an editing error, but if so, it is a major one. As for yard capacity, it is unclear where the additional trains for the Line 2 Extension will be stored or serviced pending the opening of that line. If they are TR-type unit trains, they cannot be maintained at Greenwood which is not configured to handle six-car permanently coupled sets. They could go to Wilson, but this will add operational complexity to Line 1’s service build up/down process which are already complex. Greenwood itself is full as the following text makes quite clear. Although the purchase of Kipling Yard is now in progress, there is no budget for detailed design and construction within the 2019-2028 Capital Budget. The 2019-2033 Capital Plan shows this yard opening in 2031 although it would almost certainly be needed sooner as a home for new trains as they are delivered. The SRT fleet overhaul will complete in 2021 after which the peak service will increase from five to six trains. The fleet will be retired following the opening for service of the Line 2 extension currently planned for 2026. No change in service or fleet levels is planned for this line in the foreseeable future. This line, with its oddball four-car TR units, has an unusually high spare ratio of 50% because it must be able to have one train out for maintenance, and one remaining as a hot spare. 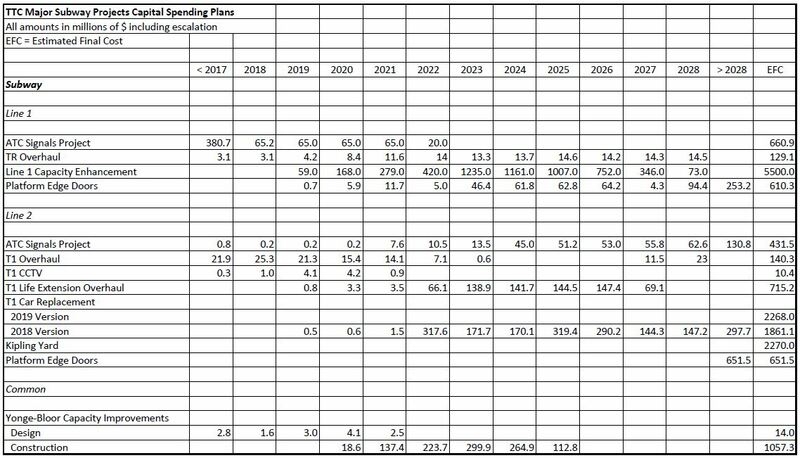 The TTC Capital Budget is inconsistent in statements about when various projects might take place, and the real indication of plans is found in the annual budget projections. The numbers here are taken from the Blue Books with the gross project costs before any adjustments for city-requested cuts. A large proportion of the spending here is not yet funded, and there will be a scramble to allocate whatever money is available to these projects and to politically sexier system expansion. Of particular concern are large budget lines for capacity enhancement projects that have not yet been presented in detail publicly, and possibly not even to the TTC Board. After years of selling Automatic Train Control as the saviour of transit to the core area, the TTC has finally acknowledged that more passengers need more station space for access and circulation. This entry was posted in A Grand Plan, Buses, Finance, Service Cost and Quality, Streetcars, Subway Cars, Transit, Yonge Subway Extension. Bookmark the permalink. You get the idea that ‘planners’ at the TTC [and Metrolinx] spend their days hiding under the furniture, praying that no politician will drop by with their greatest new project. This kind of semi visible, secretly revised, worry in ten years planning has become the norm for GTA transit. What a colossal waste, of money, and professional expertise [assuming there is any remaining]. Some professional appears to have persuaded Doug that subway financing with depreciation cash is not possible, since, as any businessman knows, there is no such item. In a way, though, it’s the perfect GTA relationship: depreciation cash to pay for unfunded projects. Thanks Steve for going through the changing drivel and giving us the highlights. The process must render you speechless for long periods of time. Sorry if this misses the point entirely, do we know if the RL is being designed for 4-car or 6-car trains? It’s odd that the cost of Platform Edge Doors on YUS are lower than on BD … and that the EFC for BD PEDs is the same dollar value as construction for the Bloor-Yonge Capacity improvement (likely a rounding issue). Steve: Thanks for catching that. The BD final cost should of course be $651.5 million, the same as the post-2028 cost. The match to the Bloor-Yonge project was caused by creation of that line by copying an existing one and not updating every field. I will update the chart. It goes w/o saying that all of the problems presented here could have been avoided by honest reporting of needs, honest discussions of priorities, and better decision making processes than are currently in place. I am somehow astonished at the scope of the “rainy day” / deferred / unbudgeted items. Looking “forward” to the streetcar version of this! It’s like politicians bury their heads in the sand and refuse to hear or acknowledge the realities of needing additional trains and storage for said trains and instead just wave their hands and say ATC will provide better service. It’s such shortsighted stupidity so they can make nice political statements. When do you think things will come to a head and politicians will actually have to face to reality of the huge backlog of unfunded projects? Same with the streetcar fleet, realistically they should be talking to Bombardier and getting the cheapest price possible while they’ve still got the production line running for an additional 100 streetcars, but instead they’ll wait until the mid-late 2020s and have to pay way more than if they bought now. Steve: While I love to slag politicians for a chronic inability to face reality, many of the problems lie with TTC management. For years they talked about the benefits of ATC, but failed to budget for more trains and yards, not to mention station expansions to handle more riders. Steve wrote: For years they talked about the benefits of ATC, but failed to budget for more trains and yards, not to mention station expansions to handle more riders. LOL! The main benefit of moving block ATC is that it allows MORE trains to be placed on the line than the fixed block system allows. The only way to realise that benefit is to purchase more trains with that ATC system. A rough analogy would be like wanting to have more people over for a dinner party, so you purchase a house with a larger dining room, but refuse to purchase a new dining room table to make better use of the larger dining room. Steve: Not to mention more dishes! Wow… one can only hope that their fleet “plans” will change a dozen times over the next few years like they always do (i.e. Kipling does get built in the mid 20s once they realize the hard way there’s no room for the new trains, and the order of new trains gets expanded to replace the T1s once they realize the hard way that their LE attempt is a failure). Nevermind the T1s, come 2041 it’ll be time to start replacing the TRs, which will also be 30 years old by then (unless they want to give them an LE as well). Perhaps, rather than deferring the T1 replacement & Kipling yard, they should’ve instead deferred some other project(s). The TTC needs better co-ordination of management. For too long each division Subway, Streetcar and Bus have been operated as individual fiefdoms. The lack of system wide planning is disgusting. Any corporate entity that found itself in a similar situation – heads of both senior management and board members would be called for. Steve has been calling for better project reporting and co-ordination for years. With the advent of the January 2019 CIP finally outlining the massive shortfall in needed SOGR capital spending, hopefully a corner has been turned. It looks as if management has finally chosen to take a step in the right direction and bluntly show the political board ALL THE PROBLEMS. This is a good start, but identifying all the shortfalls is only a first step. The choices going forward need to be clearly laid out, with each item on the decision tree showing the pricing, resultant benefits, and impact on reaching long term goals. Providing the Board with several sets of “choices” with the “cost/benefit/impact on next steps” (CBINS) attached would allow TTC management to get on with the day to day operation and let the Board make the “tough choices”. This would put the accountability where it should be. As the veil is lifted on the iceberg of TTC planning, the only obvious solution for most of the issues is to spend money. The City has “blown the budget” on the police already this year, so for the TTC it will be hurry up and wait for next year…maybe. We do have a Federal Election looming this fall. Just in time for the federal political parties to try and buy Toronto’s transit poor on election day. Have been wondering recently given the timelines to get Obico going whether a Vincent or larger size storage/light maintenance yard might be a) feasible and b) operationally useful in the vicinity of Warden station, with the objective of being able to free up Greenwood tracks to assist reworking of service bays to support new trainsets, and space to operate commissioning/testing trains during Relief Line startup. If the idea is eventually to move most or all Line 2 trains out of Greenwood, it might be needed anyway to ensure enough trains are stored east of the Viaduct to operate service in the event of an outage. Also, if the assumption is that T1 trainsets are now worth life extension and refitting with ATC, couldn’t the first few trainsets be transferred to Line 1 to act as gap or capital spare trains? There may still be a question of how to store them over there but it would potentially shift the capital spend bulge a bit. Steve: First off, there is no land large enough near Warden to hold a Vincent-like facility. Don’t forget that the yard at Keele extends from the east side of Keele Station and ends at the west side of Dundas West Station. There is an entrance to it off of the stairways down to the subway level at Dundas West. Second, the problem at Greenwood is that is a stub end facility, not a run-through shops, and the transfer table is only two cars long. Maintaining TR equipment here would be a big challenge. In the satellite view, there are two buildings. The southern one is for running maintenance like cleaning and it allows trains to drive through. The northern one is for major maintenance and is stub-ended. Very true, TTC management and the TTC board both need to be better at communicating the issues to city council. As you stated in the article, at least with the recent updated 15 year capital investment plan instead of 10 year plan the scope of the issue and amount of unfunded projects is (hopefully) better understood by everyone involved. Steve, have you ever looked at transit construction costs in Ontario relative to other jurisdictions? It’s no wonder that we have a huge backlog of unfunded capital improvements when even relatively uncomplicated projects come with mind-bogglingly high cost estimates, such as the new line 2 yard to be constructed for an estimated $2.27 billion dollars. With typical Line 2 daily ridership of 527,000 for 2018, that’s about $4,300 per rider for a capital project that doesn’t intrinsically provide any benefit at all to existing riders. In my mind, there comes a point where it doesn’t make sense to make any investments in increased capacity or service at all, because the cost is so out of line with the realized benefit. Steve: Don’t forget that this includes extending the subway west from Kipling Station to the new yard, and the increased cost thanks to the project being put off until the late 2020s. Even so, I am surprised at the high cost, and suspect that more than just the new yard and shops is buried within the project. Many thanks again for all of this Steve, although it is both very complex and very frustrating as we are in an even bigger mess, it seems, than supposed, even before Premier Fact wades in to bust it open for likely-dismaying results. It’s hard to understand it well enough ahead of any comment as things keep changing, including a new post, thanks again. But at what point do we really start a reset of our thinking about evermore extensions to a very brittle system to figger out how we can shed load to other options like GO, like new surface routes, and yes, I’m thinking of somewhere in the Don Valley for surface up to Eglinton, and a good connection? And the delays in doing something for Bloor/Danforth and current pressure means, to me, even more logic and rationale for bikeway relief, which in London, TfL suggested might be up to 10% in some areas. But sadly, since B/D has been #1 for an east-west bikeway since 1992, and the City has been an abject failure in getting to even a tiny bit of that in the 2001 Bike Plan between Sherbourne and Church (for $25,000), it does seem to be a pipe dream, but exhaust, and not pot. With the costs, and always more lurking from becoming a bit pregnant with this particular line extension, or that one, what a shame we haven’t invested in better planning, which at this point, given the politricks and past politicis, should be an out-of-country expertise that won’t be worried about becoming fired, and groups like APTA and UITP are prime candidates I think. With storage issues, likely nobody within the system would suggest that we store trains in the Sheppard stubway, and maybe there are several to many reasons why this wouldn’t be a good idea, or even a not-bad idea, for a little while. But once again, there’s an issue of having a full exploration of ideas being throttled by political limitations, and the politicians aren’t paying for the costs, either. Wow! Thanks for an incredibly detailed review. Thoroughly enjoyed reading it. Sheer bad planning if you ask me… where did we send the “lad” again? The preceding comments have left little more to be said. City councilors and TTC board making decisions without being aware of undisclosed conflicting considerations. Transit planners and their overseers heading in uncoordinated directions. Sad for transit users, taxpayers and the city community that we really can’t cope with providing for our transit needs. And now Doug Ford deciding what will be built…. not good, but can it be worse than the lack of direction and indecisiveness we read here?